Last night at the White House Correspondent’s dinner comedian Michelle Wolf did the impossible, made many in the MSM so uncomfortable and jumped the shark so far that even they are calling it too have gone way far and outrageous. Not only was this not funny, it was vile, mean and downright nasty. But this is what the LEFT has become these days. Who knew it was ok to make fun of women’s appearances? I thought the LEFT said that was off limits. Except when it comes to their double standard. Even the liberal media think it crossed a line. However, that ddidn’t stop many inattendance from laughing. The White House Correspondents’ Dinner ended with a barrage of vulgar anti-Trump jokes by comedian Michelle Wolf, who attacked the appearance of White House press secretary Sarah Sanders, who was sitting with her at the head table. What they’re saying: White House officials in the audience thought Wolf’s patter went too far, and thought the attacks on Sanders and Kellyanne Conway were too personal. Be smart: That creates a new hurdle for the White House Correspondents’ Association to lure President Trump, who has snubbed the dinner the last two years. The more James Comey talks. the less credible he sounds. What becomes obvious is that there was a total double standard when it came to the Trump and Hillary Clinton investigations. It is chilling that he can’t see it. Comey doen’t think he leaked , does sneaky things or does weasily things. Guilty on all counts. (2.) On the Clinton email scandal probe, Comey defends his actions over the course of that process — persuasively at times, and less so at others. His explanation of his judgments about Clinton’s criminal intent wasn’t terribly compelling to me. Baier plays a montage of Comey confirming multiple lies Clinton told about her improper and national security-compromising email scheme, essentially asking how intentional deceit about arguably illegal conduct doesn’t signal intent (Trey Gowdy made the same point). Comey responds that Clinton lying to the media and the American people isn’t the same as lying to the FBI. That’s true as a legal matter, but lying to the FBI wasn’t the core potential crime under scrutiny; gross negligence in handling classified materials was. Was Clinton merely sloppy (or ‘really sloppy,’ as Comey puts it in the interview), or did she have an ulterior motive for her reckless set-up, of which she was well aware and calculating? Her repeated public lies about her actions suggest the latter. That ought to be the relevant standard on divining intent within that context, in my view. Plus, “sloppiness” does not explain the lengths to which she went to bypass the rules and accountability, nor does it cover the knowing falsehoods and evidence destruction she engaged in when caught. THIS IS THE LEFT’S WORSE NIGHTMARE … BEING BLACK DOES NOT MEAN YOU HAVE TO BE A DEMOCRAT. First Kanye West set social media afire with his support for President Donald Trump. That can’t happen, the Progressive LEFT, actually more like regressive, demands that group think demand that all black people must be against Trump, all the time. However, that is not the case when it comes to Kanye West. I must admit that I have not always agreed with things that Kanye has said; however, he has the right to say and believe what he thinks. In this case he is showing real courage and way going against the norm. 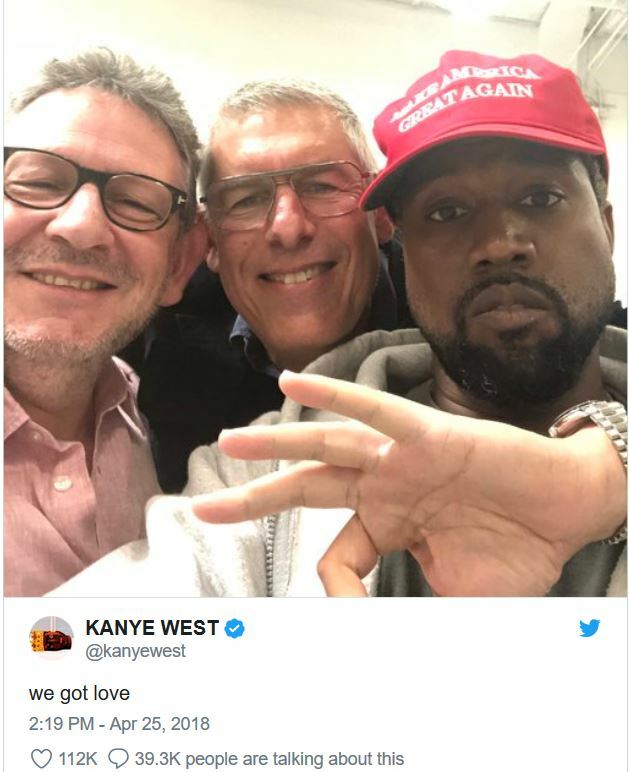 Then he went all in … Kanye West caused a liberal Twitter meltdown again on Wednesday by tweeting support for President Donald Trump,while wearing his “Making America Great Again” hat. A note to the ridiculous media, no one should ever agree 100% with anyone, unless you are apart of the Progressive group think. Kanye West criticizes Obama and praises Trump: ‘The mob can’t make me not love him’. 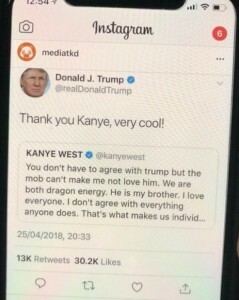 Trump thanked Kanye West for his support. Kanye West’s recent praise of President Donald Trump has left some of the rapper’s fans aghast, but fellow Chicago rapper Chance the Rapper and West’s wife Kim Kardashian have come to his defense. “Next President gon be independent,” he added in another tweet.